Twizm Whyte Piece. Swagstar Rapper, Best Of The New Next, Reppn God, Family, Money, Indy, 2G. With over a 146+ shows performed, 10 c.d.s, 16 videos, and Now Host Of 2locoradio.com Mon/Wed/Fri From 7-10 Pm Playing The Hottest Underground And Independent Artist. Twizm Whyte Piece Is on His Road to Glory. Check Him out father of 5 children with music that's family friendly. Best Of The New Next, Amazing Talent, Million Dollars Walking, And Hype-man Of The yr. are Some Of the Terms used To describe The newest phenom Making His Way up The Ladder of success. Twizm Whyte Piece, Caucasian Artist With Five Children, Superb Wordplay And A natural Ability When It Comes To Stage Performance (Electrifying, Energetic, And Always A Definate To get the Crowd Moving, Was Born In Page Arizona To What You Would Call The Classic Ghetto Symptoms No Father, Mother a Drug Addict And no Possible chance Of Rising Above his Environment. However This Never Stopped Twizm Whyte Piece From becoming A better human Being And Finding A path in life. 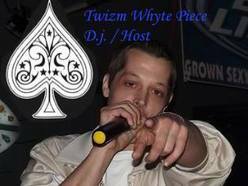 Twizm Whyte Piece Started Rapping And Rhyming back In Middle School And Continued With It All The Way Thru Life. Eventually turning a street corner hobby Into An Amazing Outlook And A Means Of Financial Security For Life. Twizm Whyte Piece is a Hip-Hop Entertainer, more worried About The Show than The Fame, Who Has Now Produced 10 Albums, countless mix-tapes, 16 videos, 146+ shows performed, thousands of fans hands shook and with another 247 songs lined up for mixing and mastering Twizm Whyte Piece Will Continue To be a force to Reckon With From Indiana. Possessing Amazing Natural social skills, As Well As An Awesome Mouthpiece, mixed with Hard Working Talent AND A BURNING DESIRE TO be the best that Twizm Whyte Piece can be no matter the trials, work required, or obstacles. Having Worked With National Artist Blake Selby As Well As Others and possessing Songs To fit any style from Street, To family Friendly, Twizm Whyte Piece Believes And Achieves The status Of The Newest Caucasian Kyng everyday. With a step by step approach that embraces social medias,fans, shows as well t-shirt, c.d. sales, promotional offers for supporting Twizm Whyte Piece, also well As Free Concerts For High Schools And Children to Sponsorship's In Marathons And Marketing Campaigns. He Has Plans And Outlooks For Ideas That Will Surely secure The Fact That Twizm Whyte Piece Will Be The Next House Hold Name. Future Plans Include Seven more Shows For The Month Of July, 4 More Videos Being released End Of July and Early august as Well As Four New C,d.s From Twizm Whyte Piece being Released on July 29th. Thank You For Your Time As Well As Interest, I believe That With The Right hand helping And continued Determination on My Part, The Right connections and Support of my Family Twizm Whyte Piece A.k.a the BEST OF THE NEW NEXT MILLION DOLLARS WALKING Will Bring Success And $$$$$$ To Him, His Children, And All Involved.